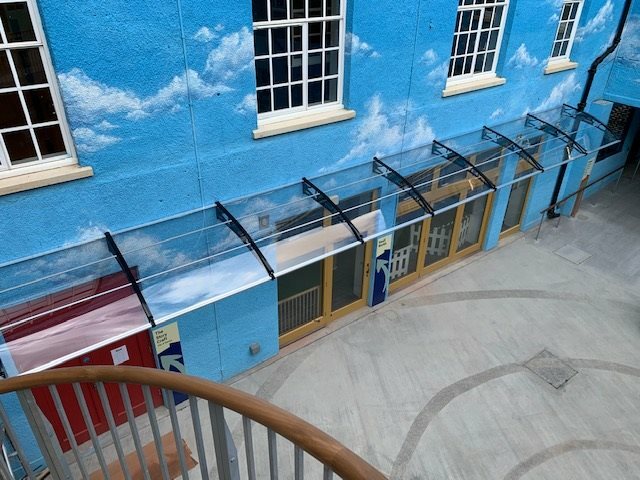 Each canopy consists of polycarbonate brackets, available in either light grey or black, with 2mm thick clear polycarbonate glazing and aluminium fixing pipes. Due to customer feedback, we are pleased to be able to offer the Canofix Cantilever Canopy without the large cut-out Canofix logo on the brackets, they now feature a smaller logo - please get in touch for photographs. The new bracket design is currently only available in the 1000mm & 1500mm projection in grey or black polycarbonate. Aside from the bracket design, the canopy retains all the features that made the original such a fantastic product. Lightweight and durable, the Canofix cantilever canopy is quick and easy to install. This is a fantastic item, it was easy to install, and the item itself is of really good quality material which will last. The customer service throughout has been excellent, highly recommended! This is a great product and easy enough to install, although if installing on to harling, it's a bit trickier and you need to allow for the depth of the harling (go in deeper is our tip!). We received a replacement bolt very quickly and foc which was well received. Great customer service, never anything any bother at all. We've recommended to friends without hesitation. The build quality was superb. It is strong and looks expensive. Great value for money. Made to measure too. I will be buying again in the future. Thanks again. We bought this canopy mainly to protect our bi-fold doors from the weather. Makes a great smoking shelter and looks great too. Definitely one of our best buys, worth every penny. Excellent quality, great price, easy to assembly. We purchased a canopy, with caution. We thought because it was cheap it would probably be poor quality. We are extremely pleased with the quality, price and how easy it was to put up. We have a pub with guest rooms and we put one above our guest entrance door, we are so happy with this product we are going to purchase a large canopy to use as a smoking shelter. EXCELLENT!